We're an Independent Trading Desk that specializes in Programmatic Media Buys for Small to Mid-Sized Agencies and Brand Marketers. Peloton combines big data, technology, creativity, insights and analytics to identify and connect brand campaigns with optimal target audiences. Our approach, stemming from our agency roots and founded in agency governance, connects your brand campaigns with powerful performance-driven media solutions that create an efficient 1:1 consumer connection. Your message is delivered and amplified across targeted programmatic platforms in real-time at scale, for optimal and enduring results. We pride ourselves on providing the human touch and influence required to create truly successful brand connections, and build strong relationships with our clients and partners. Our customer-centric approach delivers exceptionally creative, integrated digital media solutions that generate results for your business and increase ROI. RESPONSIVE+ ADAPTABLE+ FLUID+ DYNAMIC+ AGILE. We work seamlessly with agencies. We speak the same language. We understand what impacts the bottom line. Much like our namesake, our integrated approach consists of on-going, real-time monitoring, optimizations and adjustments. A Peloton is the main group of cyclists in a race who constantly adjust position to reduce wind resistance and gain competitive advantage. As a co-operative unit they dramatically conserve energy for the final push to the finish. 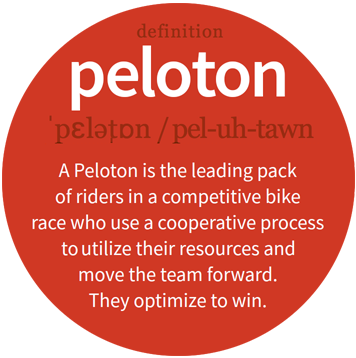 Peloton formations serve as a perfect metaphor and model for our approach as they are constantly making real-time adjustments in response to their surroundings and environmental conditions. Collaborative and cooperative. Leading and following as required by the group dynamic. Fluid, dynamic and agile.